Get our free training to help you create your library's campaign committee and win! Any strong campaign for libraries varies significantly from the next. There are a wide range of variables that have drastic effects on the campaign such as access to resources, size of and scope of the jurisdiction, type of ballot measure, etc… However the success of the campaign will depend greatly on the structure or backbone of the organization running the campaign.The individuals that you choose to support your campaign and their roles and responsibilities will have a significant effect on your campaign's outcome. That's why we wrote this guide. This guide will help you understand the roles and responsibilities of everyone on your campaign committee so you get off to the strong start. 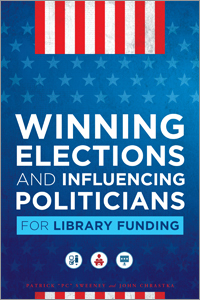 This guide was written as part of EveryLibrary's efforts to train librarians to win elections and funding initiatives. EveryLibrary is a 501c4, Political Action Committee that has worked with over 60 library campaigns and helped them win over 230 million dollars in stable yearly funding. We do this work becasue 90% of funding for public libraries comes from the will of local politicians and, in turn, from local voters. So it’s urgent that librarians, library supporters, and anyone interested in running an election or campaign for a library understand the strategies, resources, and tactics necessary for positive political action. Whether election day is four months away or four years away, there are immediate steps library leaders and local library ballot committees should take to help secure a successful ballot initiative later. For more complete training, our book is available from ALA Editions and Neal-Schuman Press.